Sheffield United showed why they have cantered to the League 1 title as they easily put MK Dons to bed, winning 3-0 at Stadium MK. Having already wrapped up the title, goals from Leon Clarke and a Billy Sharp brace put the result beyond Dons, though had Dean Lewington's first half effort bent in off the post, it could have been a different tale. Robbie Neilson made two changes to the side which beat Southend on Easter Monday, with Robbie Muirhead and George Baldock returning to the side, while youngster Callum Brittain and goal-scorer Ben Reeves dropped to the bench. Following the announcement of his departure on Thursday, goalkeeper David Martin remained out of the side behind Lee Nicholls, who made his sixth start in a row. But he was almost picking the ball out of his net inside 10 minutes when the champions surged forwards, giving Chris Basham entirely too much time to dance through the defence before pulling back to the usually clinical Billy Sharp, who struck the base of the post. The home side absorbed the early pressure from the visitors well, seeing a Mark Duffy shot skim wide, but began to grow into the game. Strikes from Harvey Barnes and Stuart O'Keefe though were never troubling keeper Simon Moore. Dean Lewington, who could be playing his final game at Stadium MK with his contract expiring at the end of the season, almost opened the scoring after 25 minutes though for the home side with a wonderful left footed effort, struck first time as United failed to clear a corner. The captain though saw his strike beat the keeper but not the upright. The shot certainly silenced the travelling supporters for a period, who were reminded it wouldn't be all one way traffic at Stadium MK, but the half fizzed out after that. The midfield was congested and thin on space, making for a tough time for both sets of strikers to make any impression. But on the stroke of half time, United took the lead. In almost a carbon copy of Ivan Toney's goal for Scunthorpe on Good Friday, Leon Clarke rose unchallenged to meet Sharp's corner and power his header past Lee Nicholls to give the visitors the lead going in at the break. The second half threatened to be a repeat of the first, but Harvey Barnes was determined to make a game of it for the home side, skipping past two Sheffield United players before forcing Moore into a brilliant save to deny him the equaliser inside the opening five minutes of the half. But while the visitors looked comfortable to coast towards the final whistle with their goal advantage, they were gifted a second on 67 minutes when George Williams' back pass was easily read by Sharp, who lashed the ball past Nicholls to make it 2-0. Chris Wilder's side wrapped it up in style with nine minutes to go when Sharp again broke in behind the Dons defence to blast his second and United's third past the hapless Nicholls. 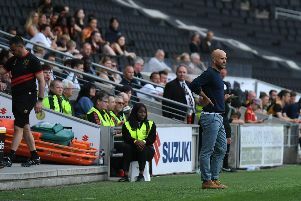 Dons fans would have the final cheer of the afternoon though, as keeper David Martin would come on for his final appearance at Stadium MK, replacing Nicholls, though he wouldn't touch the ball in stoppage time as United comfortably saw out the game.